If you’ve just bought a hot tub, then you’ve likely been told that you should keep your cover on the tub when it’s not in use. Why? Well there are a number of reasons why it’s important to cover your spa when you’re not taking a dip. You’ll find that it improves the efficiency of your tub, it keeps debris out of your spa, it reduces wear and tear, and it ensures that your spa is safe and protected. The first and foremost function of your spa cover is to keep the heat in the tub, and to keep cold air and precipitation out. Your hot tub cover is designed to insulate your tub against the outdoor atmosphere and elements. 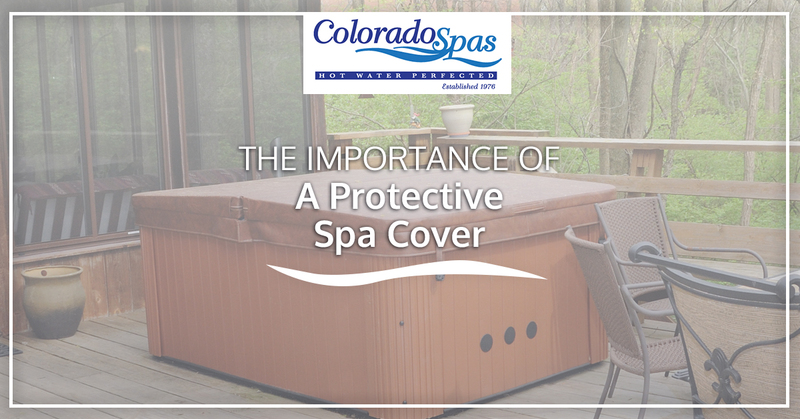 You should always keep your cover on when it’s not in use, in order to keep your spa operating efficiently — otherwise, you could see a spike on your electric bill. Think about all that dust and debris that settles on your porch and patio. Now imagine all that stuff finding its way into your hot tub. If you leave the cover off your spa, you’ll find that it’s liable to catch leaves, dirt, dust, tumbleweeds, you name it. Instead, keep that tub covered, so that you can keep your water and filters clean. If you happen to leave your cover off for a while, just be sure to check the chemical and pH balance of your water, and clean out your filters. It’s a good idea in general to keep your cover on your spa. If there are pets or kids in your neighborhood, your hot tub can be an (albeit unlikely) hazard. Keep that cover on your spa to keep curious kids and pets from jumping in. The sun’s rays won’t damage your hot tub much if you accidentally leave the cover off for an hour or two. However, over time the sun’s rays can discolor your hot tub, including the sides of the tub, various fixtures, and the headrests of your spa. Fortunately, these components are designed to resist ultraviolet rays, and keeping the cover on your spa on those sunny days will ensure that interior components remain protected. If you’re worried that someone might try to use your tub without your knowledge, then a locking cover will ensure that it remains private. Many tub covers come with secure, locking straps that you can latch with the turn of a key. If you have an old tub that could use a new cover, or if you’re looking for the perfect cover for your new spa, we can help guide you to the right solution. Give us a call if you have any questions about our spas and accessories or visit us in our Fort Collins showroom!